It’s a best adobe muse templates collection of 2014. From this post you can Download free and premium adobe muse templates for your web design project. All these muse themes are high quality fully responsive and easy to customizable. When your designing a photography website or a portfolio website but you don’t have coding knowledge then a ready made high quality photography muse template or a portfolio muse template can save your lots of precious time. As we know muse is very popular because of it’s easy to use features so you don’t have to spent hours to thinking how your design going to be, just pick a template from this list edit it depending on your requirement and you are done. We understand that when you are first starting out online you not only require an muse theme that you can rely upon but also one that is affordable. This is why we have put professionally designed website template that will not break your budget and will be easy to edit to suit your purpose. We hope you will enjoy these web template and keep checking back as we are constantly updating new and exciting website template. Don’t forget to share this post. Solo is the most useful template you ever need. It has all the best essential features of a multipurpose landing page. Verona is a cutting-edge restaurant template for Adobe Muse. It boasts a lightweight design with sliders and other visual improvements. As any other Muse template, it is very easy to edit – you can change the contents of its pages in an intuitive drag & drop way. The template is cross browser and comes with a pack of source PSD files – in case you prefer this Adobe product for designing websites. Unicore is a beautiful page builder for beginners. It pack with lot of amazing features like toolkit, well design, app design and much more. If you have a project which needs to showcase many images for a bigger conversion, this is a template which is definitely worth attention. Have a look at the Parallax effect and think how it could complement your website. A sticky menu and a sticky back-to-top button let your visitor get to a desired website section in milliseconds. Remember that only choosing amazing Muse templates will take you to creating successful websites. If you have high aesthetic standards for a web design, you may enjoy the design of this template. You may spend hours searching for great muse templates on the Web, because many of them are incredibly stunning. Or else, you may save your time, because this Muse template may be the one for your project. It has a beautiful symmetry which no one can resist, and boxes which go invisible when you hover over them, will definitely attract special attention. See for yourself, check it out! Mobirise is a free bootstrap multi-purpose template for any business, personal portfolio websites or blogs. It is user-friendly and looks great in any device. It is the best muse theme for an individual or team to showcase their portfolio and talent. Full editable (Change all color, font, pictures) – Contact Form – Gallery – Webkit Fonts – Short Codes to improve your site. It is a modern and clean one page Adobe Muse template designed for Agency and Creative Studios. It is perfect for any NonProfit or small team to display their trips, projects, or partnerships while traveling the world to do good. It is a bold Muse Template with modern flat colors and appealing typography. Images, colors, textures, content or all very easy to customize without writing any code. Today’s freebie is Adobe Muse online store theme. Save you time and money. Use this template in your next personal or commercial project. Adobe Muse landing page is a template for small creative teams. The template has scroll effects parallax animations and many features to get your company website to market quickly. Easy to modify colors and type in a few minutes. This theme is just what you have been looking for. Muse Builder uses the built in powerful features of the Muse software to bring a stunning, professional solution to your website or next big project. It is an advanced, parallax, one page Adobe Muse template made by FAR Interactive. It is the Muse Photography, Portfolio, Personal website Template built with latest Adobe Muse features. It is a modern and clean Adobe Muse template designed for Corporate, Business, Agency or Multipurpose. It is a beautiful, modern, stylish and straight to the point single page portfolio Muse Template. 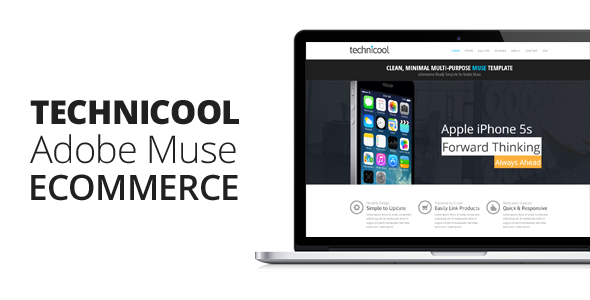 Creating a Muse eCommerce website has never been easier with technicool—the best Muse eCommerce Shopping Cart Template available. 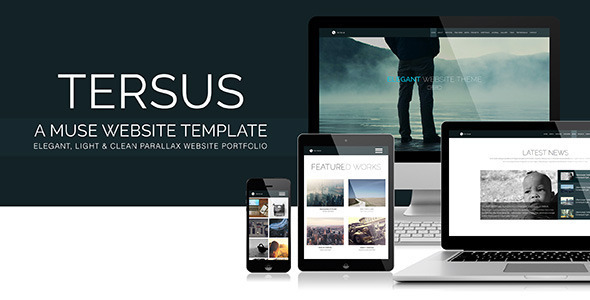 Powerful site template designed in a clean and minimalistic style. THNDRBOLT’s Muse Shop Adobe Muse theme is the first Muse theme to offer an integrated selling platform into its website. It is an advanced single-page, parallax scrolling, minimalistic theme with lots of useful features, built by Qooqee.com. Alegra is a theme developed in Adobe Muse, especially for advertising agencies or freelance designers who need a creative and clean online presence. Milo is a slick, single page website designed by MuseThemes.com. This theme features a dual pinned navigation menus, and three unique color options. Business is a professional Multi-Purpose one page fully customizable adobe muse template. THNDRBOLT’s Agency Visual Adobe Muse theme is a perfect muse theme website for any advertising agency or use for your personal portolfio. THNDRBOLT’s Goodworks Adobe Muse theme is a multi-page website template for any NonProfit or Company to use. Nextra – Multi-Purpose Adobe Muse Theme. Nextra is a modern and clean Adobe Muse template designed for Corporate, Business, Agency or Multipurpose. Kazzabe is a muse template designed for musicians and bands. Edit this template is very easy, you can change colors, add new sections, widgets, replace pictures in a few minutes. Molaneo Corporate – Adobe Muse Template. Molaneo is a modern and clean Adobe Muse template designed for Corporate, Business, Agency or Multipurpose. Two Template Version – NeXon – Multi-Purpose Parallax One Page Creative Template. Puremuse is a pure & clean Adobe Muse template with elegant typography and flat colors. The theme features a complete mobile version as well as unique custom widgets with contemporary styling. 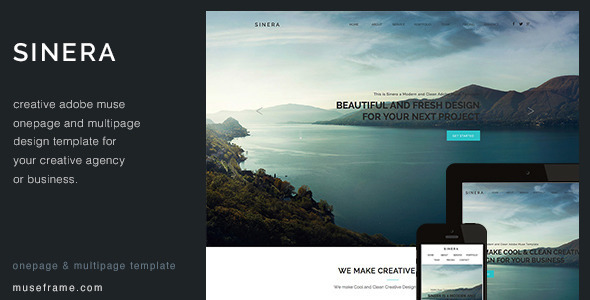 Wiva is a one-page Muse template with simple and clean design. You can use this template for personal, business, corporate one page sites or landing pages. Hi. We want to let you know that we have released Adobe Muse version of the popular ReWalk. I am glad that you liked it . I found here a lot of great templates. I think I will use some of them for some new projects. Hey Michelle, It’s really nice to hear that These templates going to help your businesses . Hi. When I try to download, it linkes me to themeforest where I can only buy these templates. Aren’t they for free? Hey Mike, Thanks for stopping by . Actually it’s a free and premium (mixed) collection. Anyway, I have included 10 outstanding FREE templates in this round-up. When I created this post I think those were the best free templates out there. You can use these free templates in any purpose. Really glad to find this site. Amazing Muse Templates. Thanks a lot for sharing.